In order to watch a video posted on Honey Bucket, you don't have to actually leave the page or open a new browser window. Just click on the small play button at the bottom-left corner of the video screen, and the video will start playing. 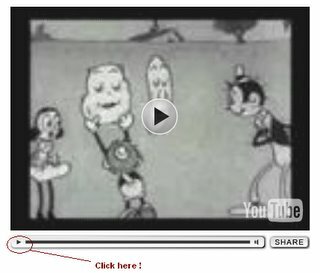 If you click on the play button @ the middle of the video screen, you might be transferred to YouTube.com or open a new browser window. That's pretty cool, but staying here is way cooler.